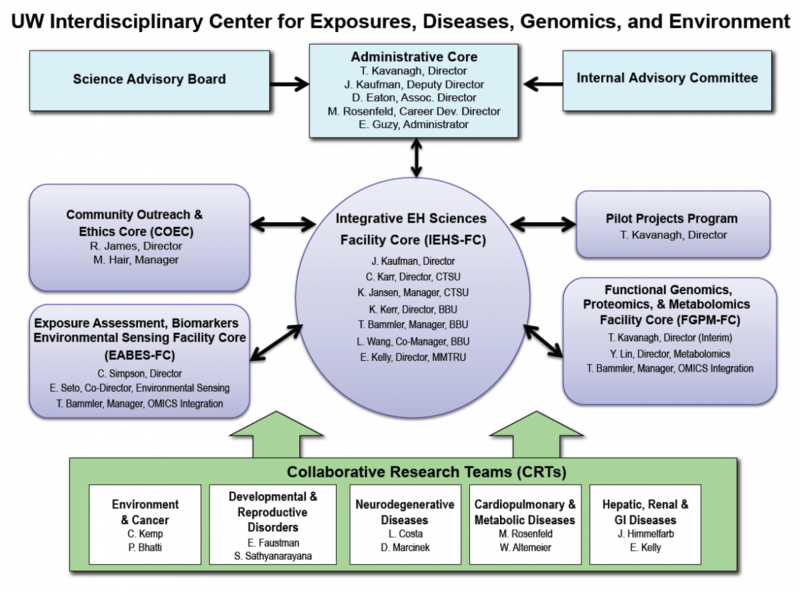 The Center for Exposures, Diseases, Genomics, and Environment (EDGE) acts as a nucleus for a wide-range of UW grants and programs with missions relevant to gene-environment interactions. Founded in 1995, EDGE strives to understand and communicate how genetic factors influence human susceptibility to environmental health risks. Researchers affiliated with the Center focus on the biochemical and molecular mechanisms underlying human variability in response to environmental exposures. The Center fosters collaborations between a large network of investigators working in toxicology, molecular biology, genetics, and environmental epidemiology, and includes a well established Community Outreach and Ethics Core (COEC) that has been serving K-12 educators, community groups, and the general public for over seventeen years. Dr. Terrance Kavanagh serves as the Principal Investigator and Director of the Center. The purpose of EDGE is to provide an administrative infrastructure and technical support to foster multidisciplinary collaborations between researchers. To this end, the Center is organized into five Collaborative Research Teams (CRTs). For the sake of clarity, faculty members affiliated with the Center are assigned to the CRT that most closely represents their primary area of research interest, although many have interests that cut across the various areas. Detailed descriptions of the CRTs can be found on the Research Page. The Center also provides members with valuable technical support through its five facility cores. Descriptions of these cores and the services they provide can be found under the Core Services Page. The EDGE Center is supported by the National Institute of Environmental Health Sciences and is part of the Institute’s Environmental Health Sciences Core Center program, Grant #ES007033. Click on the Organizational Chart below to view it in PDF form.